Pokémon GO has only been on the market for two weeks but has more daily active users than Twitter and people spend more time on it than Facebook. By now you've heard about Pokémon GO, the latest augmented reality game that has quickly earned the title of most viral app of all time. In the game, players are tracked by GPS and search real-world landmarks for Pokémon characters, Pokéstops (places where players collect items called Pokéballs), Gyms (where captured Pokémon battle one another for control of a location) and valuable Pokécoins, which can only be won in the game or purchased in-app. U of T Scarborough students were quick to embrace the game, many playing before it was officially available in Canada earlier this week by changing their iTunes App Store to a US account for iPhone or downloading a .APK for Android. "It's changing the way students use university spaces," says Bushra Nabi, a fourth-year student who we found playing at the HWing patio. "A lot of outdoor spaces at UTSC weren't really utilized like this before, especially in the summer, and now when you walk around campus spaces are filled with students who are meeting others and working together in the app." Neighbours are also dropping by campus to walk through the dense concentration of Pokéstops after hearing about rare Pokémon sightings in the Valley—UTSC's ravine area—which houses a baseball field, tennis courts, walking paths and the historic Miller Lash House. We spoke with Jenna Jacobson, PhD candidate at U of T's Faculty of Information and whose research focuses on digitial cultures. She says, "It’s certainly not just a mobile game for kids. From lawyers walking around Bay Street, to students and professors walking across campus, Pokémon GO affords a spirit of play and exploration that brings people together and outdoors." Having a GPS signal and being active with your device is integral to game play. In fact, it's the only way to progress throughout the game. When you are on the move, the technology behind augmented reality is able to recognize how you move and how your camera is positioned, which allows the app to get a sense of your surroundings and then model features occuring in reality. When you flip the app from augmented reality to camera-mode, it uses computer graphics to generate images of Pokémon that then show up as if you were looking at them live through your camera. Looking to spot players at UTSC? The Science Wing Quad is a popular location because of three Pokéstops in the immediate area, along with comfortable patio seating and umbrellas. You may also notice more people than usual enjoying the Sakura Grove, where UTSC's fiercely contested Pokémon Gym is placed. The UTSC Sneaker Squad has tempted players to join in for a run to catch 'em all, and the Library's MakerBot 3D printer has been showing off its Pokémon-themed print jobs. Need a workout? Head over to the Toronto Pam Am Sports Centre where you'll find Pokémon characters working on their fitness. While the game seems to focus on the virtual world and aims to capitalize on our always-on and mobile-culture, there's much opporunity for real-world interaction. "People are talking about the location-based game both online (on social media) and offline (at public places like Pokéstops) to discuss what team they joined, learn new strategies and share their experiences," says Jacobson. Players can look forward to Pokémon GO Plus, a wearable device for enjoying the game sans smartphone that also sends notifications using LED and vibration. Simply wear it like a watch or attach it to a pocket while on the way to leveling up. The wearable will be on every back-to-school list so keep your eyes open for a Canada pre-sale—the device sold-out on pre-order in the United States. Insider tip? Keep your Pikachu pointed on the EB Games website as we hear they may offer the Canadian pre-sale soon. It's not just UTSC that's into the craze—you can learn about sightings on all three U of T campuses and also hear from both the Father of Wearable Computing, U of T electrical and computer engineering Professor Steve Mann, and computer science Professor Eugene Fiume on this phenomenon and the future of augmented reality. 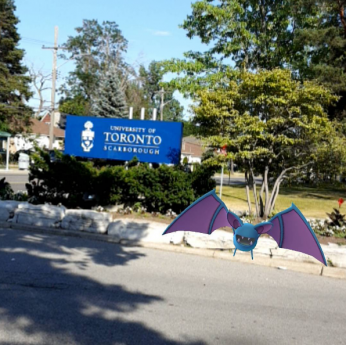 If you're playing Pokémon GO at UTSC, let us know your favourite locations on campus to catch Pokémon—and what team you're on—by using the #UTSC hashtag on Twitter or Facebook. And good luck searching for the Ivysaur or Mew. Update! A Toronto player is the first to catch all 142 Pokémon in North America—and credits UTSC as being the only place in the city you can catch so many Pokémon. While he was in the Valley, he caught a Charmander. So go out, have some fun and catch a Pokémon!